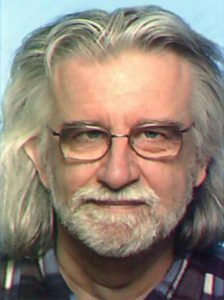 As a scientist, musician, and Christian thinker, Zöller-Greer has spent his career as a polymath—from writing papers on Quantum physics, composing music (using his own name and pseudonyms like Peter Z., Väter Mannheims and Lee J. Cooper), to teaching engineering and artificial intelligence at Frankfurt University of Applied Science, to his early career as a German pop musician; Zöller-Greer has had an amazing life. But with a recent health scare, the night and weeping came upon him. What, specifically, attracted you to Benedict’s depiction of Jesus in the books, I ask? 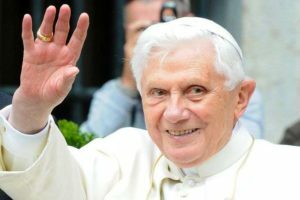 “Pope Benedict is sometimes called ‘The Mozart of Theology,’ and I think this is a very good description of him. 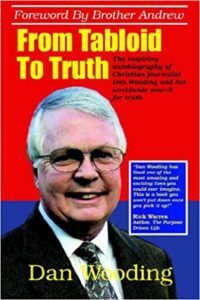 His books have a depth that is rarely found. 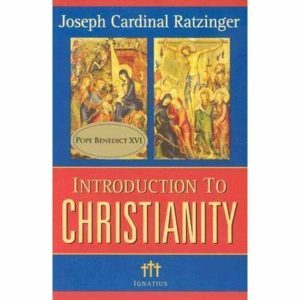 As an example, his world-bestseller Introduction to Christianity is marvelous; it is even used in many evangelical universities. 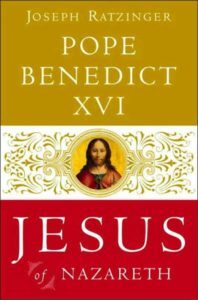 His insights are Bible-based, and Benedict’s knowledge of ancient languages is astonishing. Zöller-Greer let me know that Pope Benedict XVI wrote him a letter, “Where he gave me his official blessings for my classical musical works.” The letter is dated March 9th, 2017. The composition must have taken a long time to complete, I muse. How long did it take you to compose Lumen De Lumine, I ask? And when did you have the courage to send the work to Pope Benedict? “I can finish a pop song in about 2-3 days (this includes recording it in a studio). A movement of a symphony, however, takes me 2-3 months (the released 1st part of the Symphony has 6 movements). The reason is that a pop song has just a few instruments, 4 or 5 or so. Whereas a symphonic orchestra consists of many instruments, and in in the case of Lumen De Lumine, a choir. And most of the instruments in a symphonic orchestra can only play a single note at a time. So, one has to compose mostly single notes per instruments, and in sum, the music needs to work together and sound good. This is not easy. What attracted you to Pope Benedict XVI’s work? How can a work like Lumen De Lumine help illuminate our commonality as Christians, centering our faith on Jesus? With the completion of Lumen De Lumine and the news from Pope Benedict XVI, Zöller-Greer has added another page–or note–to his amazing life-score. And though wrought with recent ill health, the testimony that “joy comes in the morning” rings true to this man of faith. For those not familiar with the life and work of Zöller-Greer, I recommend a short article I wrote a few years back as in introduction to his work and thought. It can be found here. 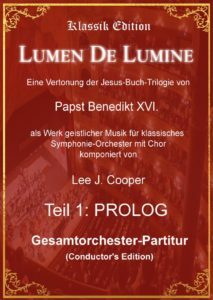 For more information on Lumen De Lumine, go to http://www.composia.de/lumen. Only God can calm the storm!